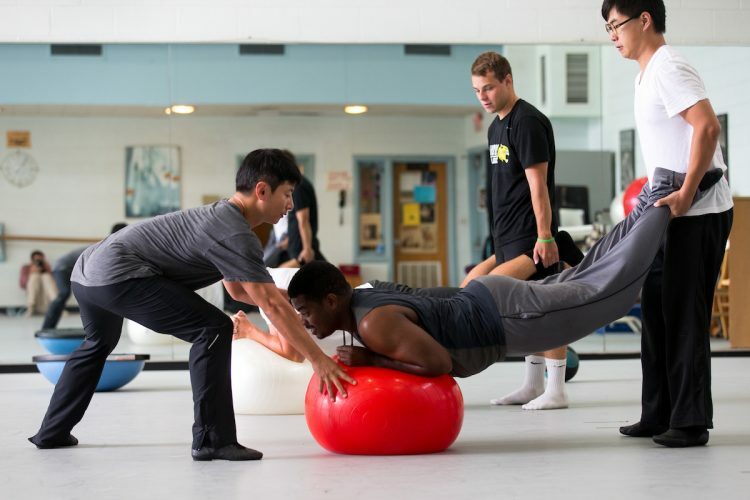 Visiting dance professor Seyong Kim works out with students in Men’s Movement class. An internationally recognized ballet performer and veteran of the Republic of Korea Marine Corps. is one of Randolph’s newest faculty members. 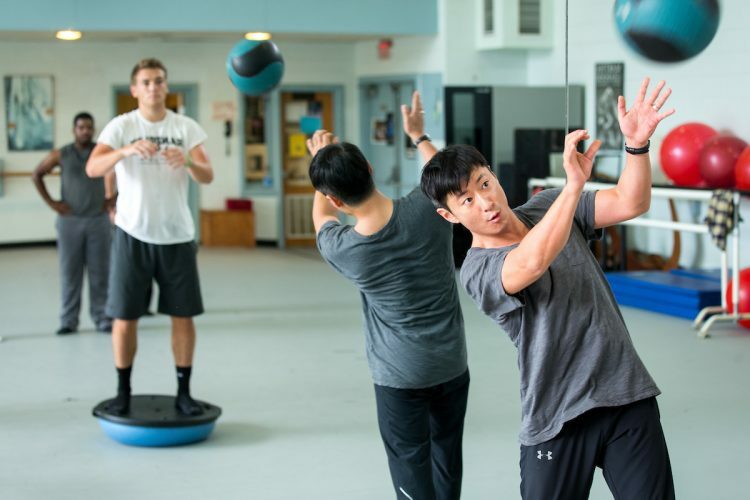 Seyong Kim is a visiting professor of dance at the College, and in addition to sharing his expertise with Randolph students, he is offering free community ballet classes this fall. Visiting dance professor Seyong Kim demonstrates how dance movements affect different parts of the human body. A native of South Korea, Kim brings with him extensive performance and teaching experience. He has earned gold medals at both the Korea Dance Association Competition and the Sung-Kyun-Kwan Dance Competition, and has performed in numerous other prestigious venues across the world. He has been a member of multiple professional dance companies, including the Metropolitan Opera Ballet in Lincoln Center, Albania Opera Ballet Theatre, Korean National Ballet Theatre, the Baltimore Ballet, Lustig Dance Theatre, and the Oakland Ballet Company. After serving four years in the Republic of Korea Marine Corps., Kim earned his M.F.A. in dance from Sung-Kyun-Kwan University in South Korea, and in 2008 moved to the United States, where he earned his M.A. in dance education from New York University. His scholarly research has been published by the Korean Society of Dance, and he has taught dance courses at New York University, Peridance Capezio Center, Libera University in Italy, Seoul Arts High School, and most recently at Rutgers University. In addition, he is a member of the American Guild of Musical Artists and the International Somatic Movement Education and Therapy Association. Kim said he was drawn to Randolph for the opportunity to teach as a full-time faculty member and because of recommendations from others in the national ballet community. This fall, he is teaching the College’s first Men’s Movement class as well as Elementary, Intermediate, and Advanced-level Ballet, and Dance Analysis. Thanks to the small class sizes, Kim has enjoyed getting to know his students and helping them refine their individual skills. His wife, Eunkyung Chung, is also a professional dancer and helps him teach classes. The community ballet classes are open to 14-18-year-old male and female students and are scheduled for Saturday, October 22 and Saturday, November 19. Enrollment is limited to 50 students in each session, and registration is now open at http://www.randolphcollege.edu/dance/saturday/.